Just like Westeros, Iceland is a land of ice and fire. The vast and largely uncharted land north of the Wall in Westeros is truly a sight to behold. It’s what the wildlings (who refer to themselves as free folk, unbeholden to kings or laws) call home. As harsh as the bitter cold and blizzard conditions appear to be, they’d choose it over bending the knee any day. It’s where the Three-Eyed Raven and the Children of the Forest reside, waiting for Brandon Stark to come to the weirwood tree he saw in a vision. It’s full of mountains, forests, and even a hot spring cave or two. For all of its horrors—and there are many, from wights and White Walkers to Craster’s Keep and the doomed and haunted wildling settlement of Hardhome—the quiet and beauty of the far north are also evident in the pages of George R.R. Martin’s A Song of Ice and Fire. Like Westeros and Essos before it, Game of Thrones brought the north to life on television in spectacular fashion. Last month on a bright and unusually warm November day, my view of Beyond the Wall in the Land of Fire and Ice was as astounding and breathtaking as I imagined. But, there was something missing: snow. Less recognizable than the Croatian city of Dubrovnik, which stands in for King’s Landing, and nowhere near as bustling as Game of Thrones’ main studio in Belfast, Northern Ireland, Iceland has become an integral part of making Martin’s imagined world a reality. The volcanic rock in Iceland has been used as a backdrop for scenes in the Riverlands and the Vale—think Brienne of Tarth’s big fight scene with the Hound and Arya and the Hound arriving at the Bloody Gate in season 4. But Iceland has mostly served as the major filming location for the wild north. According to showrunner David Benioff, they were searching for something “really kind of shatteringly beautiful and barren and brutal for this part of Jon’s journey” when they settled on Iceland for season 2 filming locations. Iceland’s humbling conditions created an atmosphere no green screen or studio interior could replicate. The show returned in its third and fourth seasons, and after a years-long break production is returning to Iceland for the show’s seventh season, reportedly filming in January 2017. Showrunners already had to delay shooting while waiting for the unusually mild weather to catch up to the harsh, wintry conditions in Westeros. When I started to plan my own vacation to Iceland several months ago, I didn’t know that Game of Thrones was planning a return. I didn’t schedule the trip to coincide with potential filming—after all, it was a vacation—but I soon discovered that it was incredibly easy to explore parts of Iceland’s Westeros. Like the other real-life cities and locations that Game of Thrones has touched in its six years on HBO, the show has been a boon for local tourism companies, helping them capitalize the fictional locations in their own back yard. It’s nowhere near the only factor to account for Iceland’s major tourism boom in the past few years, which includes the 2008 financial crisis and Eyjafjallajökull’s 2010 eruption. The European country now receives far more tourists a year than it has permanent residents, and for some travelers Game of Thrones is certainly part of the appeal. Some day tours operate out of Reykjavík and will take you to various filming locations in Þingvellir National Park (also included in most Golden Circle tours), Lake Þingvallavatn, and Þjórsárdalur Valley. Another option, which is the one I eventually settled on, is a pricier day tour based in northern Iceland that explores filming locations around Lake Mývatn. I wanted to visit Akureyri, the second-biggest town in Iceland, so the tour made sense. I landed in Iceland on a Saturday morning and by nightfall I reached Akureyri. Once I settled into my hostel, I almost immediately regretted scheduling the tour so soon after my arrival. I did it mainly for the weather—I didn’t want to get stranded up north by a potential blizzard—but I had hardly slept in the days before I left and the idea of spending a long day driving around the north while jetlagged wasn’t very appealing. I didn’t have to worry for long: The views made everything worth it, and I joked that I couldn’t believe the places I saw were real. I soon found myself with my own personal tour guide, Lilja, who picked me up shortly before dawn. With Iceland’s tourism boom, more people are venturing up north, even in winter, so tour companies are able to operate all year. On this particular day, I just happen to be the only person to sign up for the tour. I situated myself and we left, Lilja heading onto Route 1, the main national road that connects most of Iceland’s residents. (Kind of like another main road.) As we drove the first stretch of the trip we were finally greeted by the sun as it darted in and out of the clouds. Because Iceland is in the Arctic, the hours of sunlight vary drastically compared to places closer to Earth’s equator. In summer, the sun sometimes never fully sets (called the Midnight Sun) while on the shortest days of winter it doesn’t rise past the horizon. By mid-November, the sun is out for a mere six hours, rising around 10am—if it isn’t too cloudy to see. Except for the powerful gusts of wind, it was far warmer than usual. I couldn’t have asked for better weather, though it always threatened to change on a whim. The first stop on the tour wasn’t strictly Game of Thrones-related, but the majestic power of Goðafoss is certainly enough to qualify it if the show ever needs a waterfall. 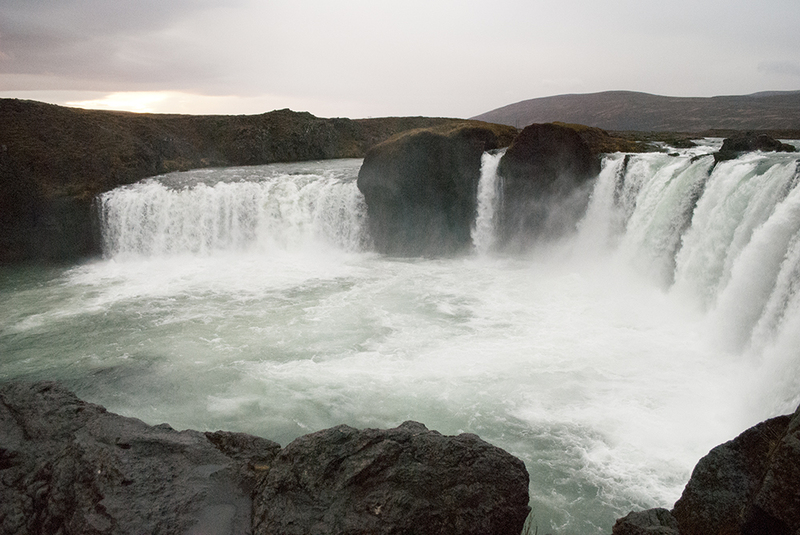 According to the legend, Goðafoss got its name more than 1,000 years ago after Lawspeaker Þorgeir Ljósvetningagoði converted to Christianity and made it Iceland’s official religion. He abandoned his old gods—the Norse gods—and tossed the statues he owned into the waterfall. Kinda sounds like a certain dutiful, would-be king abandoning his own gods for a new religion with fire, doesn’t it? Most of the day we spent on Lake Mývatn, which is home to much of Game of Thrones’ third season. Before leaving the van, Lilja showed me a clip from the show that highlighted a particular area we were about to see. The first clip featured a rocky area called Höfði, which you can see in the season 3 episode “Kissed by Fire.” Some of the distance shots were filmed across the water, right around the spot where we stood. Another scene featuring Mance Rayder takes place nearby. A few years ago, Chris Newman, a Game of Thrones producer who previously worked in Iceland on other projects, contacted Lilja’s company and wanted to tour the area. He later returned to scout it with the showrunners, and they hired local extras and crews to help with production. Although Game of Thrones had yet to reach the level of popularity it has now, they informed the tour companies where they were filming so guides could reroute their tours. For this season? There might be lots more demand. Dimmuborgir, a series of volcanic rocks and cliffs formed by lava, was the next stop on the tour. It formed the exterior of Mance Rayder’s camp; crews set up the tents long before the actors show up. Legends say the randomly formed rocks and cliffs were once trolls who lost track of time and were caught outside as the sun rose. During the holidays, it’s also home to the Yule Lads, Iceland’s 13 Santas, who gift children treats. After stopping at a local restaurant for lunch, Lilja and I made our way to Grjótagjá, a small cave that inspired one of season 3’s most famous scenes. The cave used to be popular for bathing, but the water temperature rose a few decades ago to the point where people could no longer go in it. Most of Jon and Ygritte’s love scene in the cave was shot in a studio, but the influences are evident. The cave is small enough for a few people to travel down and explore, but visitors have just a few ledges of standing room. It was hard to imagine a film crew coming in here to film anything. I stuck my hand in the water to feel its heat for myself. It wasn’t as hot as it once got, but it still felt as though it would be uncomfortable for more than a minute or two. I immediately regretted my curiosity as my wet hand met the wind. Sometimes, Game of Thrones used the terrain not for what it looked like, but rather what it could offer. For example Námafjall Hverir, home to bubbling and boiling mud pools, mud pots, and fumaroles that constantly belch sulfurous steam. It was the fumaroles in particular that helped create the ominous atmosphere Game of Thrones wanted for the opening scenes of season 3 when Lord Commander Jeor Mormont scolded Samwell Tarly for not sending out the ravens. I might have arrived in far warmer conditions than what those characters encountered, but the sheer force of the wind made it easy to imagine how little acting it would’ve taken to illustrate the man-felling power of the northern winds. I thought my tour guide was taking a photo, but she shot this instead to capture just how powerful the fumaroles are. Also, the wind is deafening. Throughout the tour, Lilja was gracious and kind. She was patient with both my questions and my attempts to pronounce some of the names of the towns and areas I planned to visit during my time in Iceland. She offered advice on different things to check out, what not to do when driving on the Ring Road, and showed me one particular bakery that used geothermal heat to bake loaves of bread. She explained aspects of Icelandic culture, such as how people are able to look up their own ancestry and how surnames are formed. I slept through most of the car ride back to Akureyri after soaking in geothermal waters as the sun began to set. According to Lilja, Game of Thrones isn’t set to return to the same parts of northern Iceland—at least not yet—and so far that appears to check out. But if they do? You just might have a better grasp of the terrain. I know I do.